The Temple and Tabernacle and Temple Mount have been at the center of world, during it's existence in days of the great kings, and even afterwards today, as we all await it's final reconstruction. But why? What is so important about this structure? What was God's objective for it's existence? As we study it, we will find that it's form is very specific in design, bearing Biblical fundamentals. 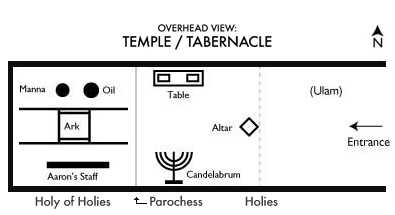 The object of this article is to shed light on the Tabernacle's following requirements: the purpose of the two rooms (the Holy, and the Holy of Holies), the various vessels found therein, and the restriction of entering the Holy of Holies except for the high priest on the Day of Atonement, Yom Kippur. The form of the Tabernacle is rectangular, 30 cubits long by 10 cubits wide; a cubit measuring approximately 1.5 feet. Its only entrance is on the eastern side. The first ten cubits upon entering are called the Ulam. No vessels are placed in this area. In the next ten cubits are found theMenora, the Table and the Inner Altar. Together the Ulam and these additional ten cubits form the Kodesh, the Holies. The remaining ten cubits are separated from the Kodesh and is called the Kodesh Kodashim, the Holy of Holies, separated by a curtian called the Paroches. In this Holy of Holies is placed the Ark, which contains the Tablets of the Law (the Ten Commandments), the staff of Aaron, the canister of oil used for anointing the kings of Israel, and the jar of the Manna—the food with which God fed the Jewish people in the desert over a fourty year duration. There is one command with regard to the High Priest which sheds light. The High Priest, and certainly other priests can never enter into the Kodesh Kodashim, except for one day of the year, on Yom Kippur. On this day, the Jews are forgiven for their transgressions. The High Priest alone enters on this day into the Holy of Holies and brings in the incense from the inner altar, places it in front of the Ark, and causes it to cloud that room. He leaves and enters only one more time to remove the fire pan with its ashes. What objective is there that none should enter into this room? Interestingly, a peculiarity of this room is that God says (Exod. 25:22) that He causes a voice to emanate from this room from between the two cherubs which are above the Ark. This implies that God is commanding us not to approach the point from which He causes His voice to project. This demonstrates the idea that one cannot approach God with one's limited understanding. As God had told Moses, "You cannot understand Me while alive" (Exod. 33:20). We can only "go so far." Therefore, abstaining from entering this room demonstrates that we cannot understand God in our present, human state. This explains the relevance of the vessels in this room. The Ark contains the Divine Law which man could have never developed on his own; ideas which must be of Divine origin, belonging to God's realm. The oil was used to anoint the kings of Israel who were chosen only by God; man has no knowledge as to who will be king. When Samuel thought to select King Saul's successor, Samuel said of Eliav (David's brother), "This is God's anointed," whereby God replied to Samuel (Sam. 1.XV, 1:7) "Look not on his countenance nor on the height of his stature because I have refused him." Thereby teaching Samuel that he had the flaw of assuming God's knowledge, and therefore required correction. Perhaps this is precisely why God did not originally instruct Samuel on which son was to be king; God wished Samuel's error be brought out into the open so Samuel might perfect this flaw. The staff of Aaron was placed in this room as well. This was the staff which miraculously blossomed into almonds during the revolt of Korach. Korach was claiming the priesthood for his family, assuming that Aaron (already chosen by God) had erred in acting as the priest. Thus, Korach was suggesting that he knew better than Divine Wisdom. This staff was also placed in this Holy of Holies, as it too testifies to God's supreme, unapproachable, and unknowable wisdom. The Manna is also a demonstration of Divine Wisdom: while it is food, it does not produce human waste. Its appearance was miraculous, which the Jews wondered "what is it?" All articles found in the Holy of Holies share a common distinction: they epitomize that which man cannot approach. In Samuel I, 1:19, a passage occurs which concurs with this idea: "And God had smote the men of Bet Shemesh because they had looked into the Ark of the Lord". The sin of these people was that they were expressing the heretical notion that they could see something (about God) by looking into the Ark. Their error was generated by a need to make God tangible somehow, which is the worst of philosophical crimes. We must, above all else, possess the correct ideas concerning God. We must know that our proximity (in terms of perfection) to God is directly proportional to our understanding of His Laws, not to the proximity of physical creations. Rambam states that "proportional to our knowledge is our love of God." Now that we have posited that the Holy of Holies—the room behind the curtain—is to remind us of that which we cannot approach, we may suggest that the Holies shares concepts that are understandable. We need not guess what those concepts are, for they are already familiar to us. The High Holidays prayers outline 2 praises to God. 1) He is Omnipotent 2) He is Omniscient. That is, God is all-powerful and all-knowing. There are only these two categories, for all acts which God performs are understood by us to be a display of either His Power or His Knowledge. In order for us to be constantly aware of this, God commanded Moses to create the Table, upon which there was always to exist the twelve loaves of bread. Twelve signifying the twelve tribes, and bread to signify God's ability to provide sustenance. God also commanded Moses to build the inner altar. Upon the Altar the priests would offer the incense, a man-initiated relationship between man and God, demonstrating that God is aware of man's actions. The Table reminds us of God's Omnipotence, while the Altar reminds us of God's Omniscience. What then is the purpose of the Candleabrum? If we look at the daily prayers, we begin every morning with "Blessed be the One Who spoke and the world came into being, blessed be He." In Daniel's blessing of God after God had granted his request to be informed of Nevuchadnetzar's dream and its interpretation, (Dan. II:19, 20) Daniel said "To the One Whose name is Eloka, blessed is He forever and ever." In both cases God is defined first, before any praise is made. This is to say that when one relates to God, it is essential that he kniows to Whom he is directing his thoughts. Therefore, we first define to Whom we direct our praises each day. Daniel did the same, and perhaps the Candleabrum serves this very purpose. Namely, to define (not God forbid to embody, which is impossible) that the God which we are relating to in the Tabernacle is the God Who created the world and rested on the seventh day. We are reminded of this by seeing the Candleabrum which is composed of seven branches, six branches emanating from the seventh, as there were six days of creation and a seventh of rest. The six branches pay homage to the seventh as their wicks must all be directed to the center seventh. The seventh, center branch dispays the seventh day as the purpose of creation. Contrary to the popular view that creation was an ends in itself for the physical, Judaism claims that the six days of creation target a goal: a day of physical abstention, enabling man time for pondering the world of wisdom. Finally, the command to create the Candleabrum from one solid block of gold (not made through soldering segments) might serve to remind us of the concept of the Unity of this Creator. 1) We must understand before all, that we are relating to the God who created the world in six days and rested on the seventh. We define Who we are praising. This is the Candelabrum, the Menora. 2) This God is Omnipotent—all powerful. This is represented by the Table. 3) This God is Omniscient—all knowing. This is represented by the Inner Altar. An altar only makes sense if the Recipien of our prayers—God—is aware of human beings and their attempts to draw near to Him. These are the categories knowable to man, and therefore: what we are reminded of by the Temple's vessels. However, if we cannot approach God directly, how is it that the High Priest can enter the Kodesh Kodashim, the Holy of Holies, and why with incense? Why is he commanded to cloud the room (as the Torah states, Leviticus XVI:13) "that he die not," and why on Yom Kippur? The answer is that as we have said, the incense represents our approach to God. The High Priest's entrance into the Holy of Holies shows us that there is a "closer relation" to God on this day due to God's act of forgiving our sins. He therefore brings in that which represents our approach to him. That which represent our prayer (incense) is figuratively brought closer to God. The same idea is represented with the levels of restriction upon man at Sinai: Moses alone drew to the top of the mountain, Joshua lower, and others still lower. The purpose of the priest smoking up the room is to remind him while he is there, that his understanding of God is still blocked, represented by the smoke. God knows that even a person who is on the highest level and enters into the Holy of Holies, is still in danger of forming erroneous ideas about God. Smoking up the room physically demonstrates that there is a veil between him and God...even in this room. Similarly, when God revealed Himself to the Jews on Mount Sinai, the Torah tells us that there was "darkness, cloud, and thick darkness (fog)" (Deut. 4:11). This again was all done to demonstrate that there is a constant veil between man and God. In regards to why there is a specific arrangement to the vessels in the Kodesh, the following reason may be given. Both the Candleabrum and the Table are placed close to the dividing curtain to represent that these two concepts are closer to perfection (closer to the Holy of Holies) than is the altar. The altar, being man's approach, is not always perfect, and is thus removed further from the Paroches than are the Table which represents God's Power and the Candleabrum which defines the God to Whom we relate. These two being undoubtedly perfect as they emanate from God. In summary, the Tabernacle is a structure which represents our limited understanding of God, but also informs us of truths. It is a vehicle for us to be aware of our relationship to God on the different days of the year, as we see differences in the sacrifices on different days. And conversely, when we witness the absence of the Tabernacle, we are made aware of a severed relationship. The priest wore 8 special garments as part of his dress. Two of which point to interesting ideas: The gold headplate, the "Tzitz" had "Holy to God" inscribed upon it. He also wore a breastplate which had 12 stones, corresponding to the 12 tribes. I believe these are to relate two aspects of a person living on the highest level: The headplate denotes that one's thoughts, his intellect, should be used primarily for understanding God. This is why it is placed on the head, the figurative location of the soul. The breastplate is placed upon the heart, demonstrating that one's heart, the seat of the emotions, should be devoted to his brethren, the 12 tribes. Thus, both aspects of man, his intellect and his emotions are subjugated to the correct areas. Our tefilin demonstrate the same.